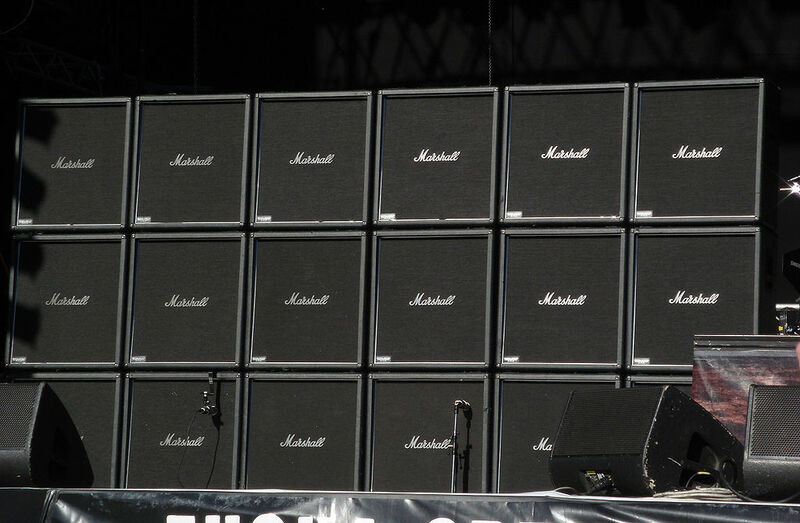 I long dreamed of playing guitar through a stack of Marshall amps. The problem for anyone in range would be my horrible musical signal going in. But that’s not the topic of this post. If I have learned anything in my unplanned career in online stuff it’s the value of putting ideas, questions out there, and sometimes to often, getting a very useful response. But it’s not usually directly from the signal I put out there, it was because someone else in my network, amplified my signal. I thought I could find relevant links for this, my first search on “network amplification” got mostly results on Denial of Service attacks. And most of my additions of keywords got mostly things more related to marketing, and gaming social media systems to “boost your brand”. I experienced this as a receiver of amplification early on. Way back in 2003, my first year blogging, I wrote about some experiments I was trying in applying RSS inspired by the RSS for Educators paper published by Stephen Downes. I sent him an email with a link to my post as a thanks. Maybe he would offer some feedback? No, he did way better. The next day he wrote about my idea in OLDaily his still widely read newsletter. And it was not just “here is something interesting” (the way people just spread links now in social media), you can tell from his words he read my post, looked at my project, and gave it some attention. I got all kinds of messages from colleagues in my institution and beyond letting me know they had seen me in OLDaily. I felt famous for an Ed-Tech 15 minutes. Stephen has been doing this for a marathon 17 years, look how much of the archive it takes to scroll to the bottom. Now that I am scrolling back to the top in time, I may not have the power of Stephen’s Marshall Stacks, but I have some. This is coming into play in several different places recently, and becoming a strategy I am putting to use in the MA Thesis Seminar class I am teaching, where I am trying to fold into the mix the benefits of networks and online research tools. Here is how it works. It’s really un-complicated. I ask my students to write a blog post with a question or a problem they are trying to address in their thesis work. Then I share the link with others, sometimes through social media. 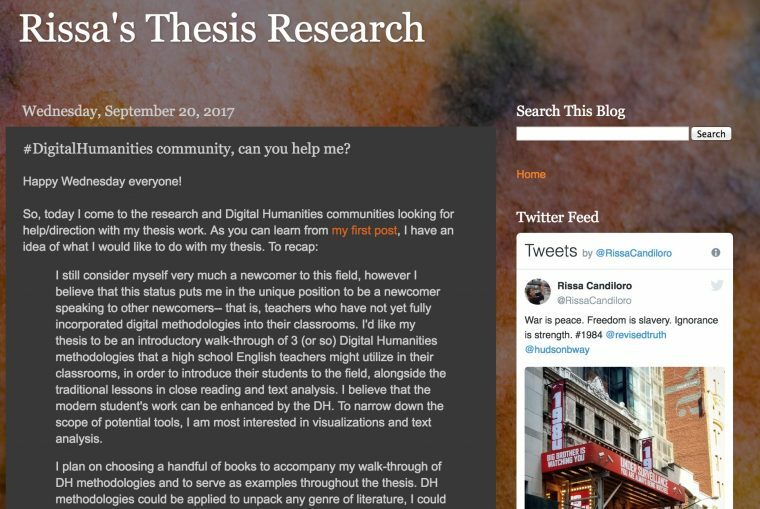 Here is a post from Marissa who is seeking ideas for applying simple to use digital humanities tools to dystopian youth adult literature. I think it triggered a comment or two, but mostly likes and retweets. Now if there is something like a Blooms Taxonomy for Network Participation, I would not even give likes/retweets a basal layer, it would be maybe a small stone beneath one corner. The thing with social media as signal is that there is not much power in the signal (unless you are Verified with 100,000s of followers). I am not audio engineer, but if you take a very small signal and plug into a big amp, you end up distorting it or getting maybe nothing. I’m not saying there is no value in social media sharing, but it seems it takes a whole lot of effort / luck to get more than a handful of likes / retweets. My students really need a bit more, people, so please give more. Give real feedback, real comments. Read their ideas, like Stephen read mine 14 years ago. But that’s not the only amplification I do- what is more effective is emailing that link or a request to someone I know in the field that might be able to help. This has much more payback, I have already seen at least 3 times with my current students. An email to/from someone you trust, on behalf of someone newer in the field, is a much more powerful amplification. I sent Marissa’s link, and an intro, to a colleague in Writing Studies, who not only provided ideas, but connected my student with one of her graduate students, and there has been a back and forth of exchange. It works in other places. I am sort of calling Mark Corbett Wilson my sixth student; he has participated in a number of my previous networked offerings, like Networked Narratives, and also in Virtually Connecting. I offered to connect him with a few colleagues I thought could give him input, but rather than me trying to fumbling explain Marks’s idea, I asked him to blog it first. Which he did, check out My College Degree as a Digital Humanities Project (and leave comments!). Having a thought out, open thinking blog post, at a fixed URL, that does not spill over the edge of a social media firehose surrounded by the other gunk, is so much more of a signal that can be amplified. One more example. One of the participants in the Ontario Extend Project I was part of over the summer direct messaged me a question for advice on a kind of technology I really have no real experience in looking at. Even if I did, an answer sent via a private channel might help her, but it leaves out perhaps other people. In the network. I am more convinced that documenting, writing out a need in a place of your own (domain? yes!) as an anchor, as reference, has more initial potential in it that a single message tossed into the pool of social media. There is of course no guarantee any of this will produce helpful responses, and so my talk of the effectiveness on my students work is really depending in the network coming through. That’s you. So please, when you can go beyond a like/retweet, and write a good old fashioned comment. Turning those amps up to… you know the number. Alan, this post really resonates with me as I am tired of behaviour (my own included) in social media that merely ‘echo’s’ the sentiments of others rather than being pro-active and helping support the amplification of knowledge networking. I teach three subjects, including the capstone in a Masters degree as well – Knowledge Networking and Digital Innovation (http://csu.edu.au/digital) – and encourage social learning, especially Twitter use, for connecting. I really like your analogy of ‘amplification’ and your ideas for supporting student work/learning. My students (those who are active online) this session have connected with experts and knowledge collaborators, and shared amongst themselves – but I will share your ideas and consider what I can continue develop further. Thanks! Thanks so much for this Julie! If you have any ideas too on maybe how to connect your students with iur “make it up as we go” research networked seminar, please let me know. Also, FYI and not fully detailed/announced, I’ll be down under the month of November; 2 weeks in Melbourne plus some stops at CSU in Wagga Wagga and also in Wollongong. Alan, would love to see you in November but not sure it will work. I am sometimes on the Wagga campus, and live by the beach in northern NSW now. If you feel like some sea air, please come and visit. Ok, so iur? more details please. Keen to connect my students to new experiences. Next class not until 2018. It’s a challenge, isn’t it? Something I’ve heard Tellio say over and over again is that we need more signal and less noise. I’m working on a presentation about “emergence” in affinity groups, and your post here is nicely in tune (with a bit of Marshall stack distortion) with what I am diving into there. I might “borrow” a bit of your thinking to flesh out my own thinking, if ya don’t mind (with hat nod, of course). Turning this sucker up to 11 and diving into the ResNetSem blogs …. Double Flickr Explored? Should Felix Be Impressed?